Zoo(m) – What did we learn? Yesterday, I went to the zoo. 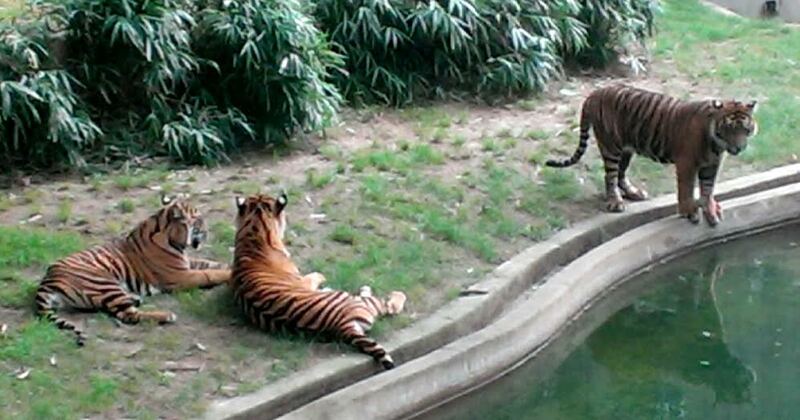 I didn’t have much of a reason – I like the zoo and I wanted to see the nearly grown tiger cubs. On my way to see the tigers I wandered into the elephant house, newly renovated and featuring several colorful interactive elements that no one really looked at. Most people were far too interested in the elephants to learn about the weight of a tusk or the brick elephant house built in 1903. I was too interested in the employee perched on the windowsill, hunched over his clipboard. After some timid circling I finally asked what he was doing. He explained how he was tracking visitor interaction with the exhibit; a usability study. How long did visitors spend in the exhibit? Were the elephants there? What was their walking path? Where did they go first? All that data would determine if their exhibit was successful. Elements no one connects with won’t be used again. I wanted to stay and ask all sorts of questions, but the guy was working and I didn’t want to become some outlying data point. So I moved on; but his usability study stuck with me. I was the only person who had spoken to him the whole hour and a half he’d been there. People had eyed him curiously, but no one asked him what he was doing. Or what elephants ate. Or why one wouldn’t put weight on his back leg. No one asked him questions except for me… and I just wanted to talk about museum assessment strategies. I saw only a few other zoo employees – security guards and retail employees. No zoo keepers. When I finally got to the tigers, I studied them for half an hour; they were beautiful and active. They went swimming, played, napped, and did a lot of sniffing. I didn’t see any zoo employees, but I saw a lot of other zoo visitors – no one stayed long enough to read the info signs. When I answered that little boys question about tigers and told him they can swim, he stared at me. He stared at me as one would stare not when a stranger speaks to you, but when no one has ever actually answered your questions before. He stared, and then he smiled – probably because no one had ever answered his questions before – and it broke my heart. Zoos are learning institutions that produce exhibitions and public programs and support informal learning. I consider them a special kind of museum with similar but unique challenges. The challenge described above, however, is universal. I am not bashing the National Zoo for not having docents on the grounds any random Tuesday afternoon; resources are tight and sitting in an exhibition for over an hour to have only one person talk to you is certainly an argument to the futility of stationing interpreters at exhibits. But I do wonder about those poor kids nonetheless. My mom took me to the zoo and forced me to listen to every sign no matter how boring the animal. We watched animals for ten, fifteen, twenty minutes. I was encouraged to ask employees the questions she couldn’t answer. And wouldn’t you know it – I’m still doing those things. But the kids around me yesterday, will they never ask? Will they shush away others’ excitement to learn? Maybe, as professionals, we should take a step back from trying to create ways for people to interact with information, and instead figure out a way to teach parents how to help their kids interact with the exhibits we already have.